The Puppet Masters are only responsible for compiling catalogs requested by Puppet Agents - they don't act as CA themselves. They only accept Puppet Agents which certificates have been issued by the Puppet Master CA. The Puppet Agent retrieves their certificates from the Puppet Master CA the first time they run. They connect to the Puppet Masters afterwards to get their catalogs. They won't contact the Puppet Master CA anymore. On the reliability front new systems won't be added to the infrastructure if the Puppet Master CA is unavailable. However existing Puppet Agents are still functional as long as they can connect to a Puppet Master. Did you ever implement this or extend on the concept further? I would be interested to see your approach to SPOF and dual site-failover resilience using this. This is the right weblog for any individual who wants to find out about this topic. You comprehend so much its just about difficult to argue with you (not that I basically would want?-HaHa). You surely put a brand new spin on a subject thats been written about for years. Superb stuff, just amazing! Hadoop Online Training . hadoop training in hyderabad referred me to this blog to know about latest trends in the IT and staffing related information. 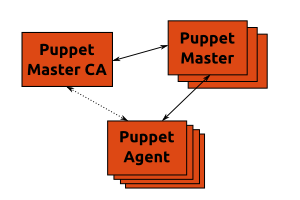 Really appreciable information on overview of a Puppet Split CA architecture with diagram. Thank you. thanks for sharing great blog with us. keep updating more useful information. It is really very helpful for us and I have gathered some important information from this blog.Keep update..
HAve an overview of puppet nice posts..
Nice post about hadoop, are you looking for best hadoop online training .